After having been absent for some time, long-running death metal stalwarts Necrophagia return, with a template largely unchanged from their last record, 2005’s Harvest Ritual Vol. 1. Like all their stuff, this is a steaming lump of defiantly-knuckleheaded death metal grooves and horror movie ambiance, which just about throws up enough unpretentiously gory highlights to make it all worthwhile. Opener Naturan Demonto suggests a slightly more high-energy sound, with its unsettling introduction of air-raid siren-imitating lead guitars and crisp thrash riffing, but by second track Beast With Feral Claws it’s business-as-usual. Necrophagia’s chugging riffs sometimes exhibit an ill-fitting up-tempo vigour (e.g. Kyra) but more usually settle neatly into the macabre unhurriedness of Dr Freudstein from Lucio Fulci’s The House by the Cemetary. Indeed, talking of Fulci, the maestro’s Gates of Hell receives proud tribute here. Bleeding Eyes of the Eternally Damned recreates the film's nonsensical grand guignol set pieces with lyrics like ‘Regurgitated guts! Storm of Maggots! ', then segues into Fabio Frizzi’s theme tune itself, with twin leads replacing Frizzi’s endearingly lumpen synths (this is one of my all-time favourite films, and those little six note phrases bring a lump to my throat). These horror references could seem hackneyed, and for sure, bands like Necrophagia and prime offenders Mortician have done their best to make them so, but they do serve to douse the band’s sound in an atmosphere of ‘video nasty’ sleaze which suits death metal admirably. There are some very strong tracks here. The grimly funny Tomb with a View follows a format similar to Obituary’s Slowly We Rot in its evocatively funereal introduction (replete with tolling bell) and bluesy lead solo. The gurning grooves of Trick R’ Treat initially bring a deathlier version of Pantera to mind before entering a cartoonishly gothic phase like a gnarlier aping of ultra-hip Swedes Ghost. 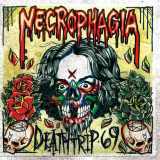 Despite the compositional twists of songs such as the latter, Deathtrip 69 could hardly be said to be an exciting album, overall, and nobody familiar with the band will be surprised by anything herein. That said, their horror obsession brings enough lurid colour (and sick humour- see the closing title track which reminds me of David Hess’s work on the soundtrack to Last House on the Left) to the band’s sound which means their albums are rarely less than entertaining. And I expect Season of Mist are thankful that they left the drum machine at home, as well.